It isn’t often all of the elements that make a great dining experience come together as perfectly as at Taverna 38 in Williston Park. Walking up to the small Greek restaurant clustered in a row of storefronts on Hillside Avenue, it is immediately apparent the white with blue trim facade holds a charming eatery on the inside. Then, greeted by a friendly hostess and staff, you are led through a dining room that can only be described as casually elegant. Once situated, a quick scan of the menu reveals a sense that this will be a remarkable meal. Taverna 38’s style lies somewhere between a quick gyro shop and high-end fine dining—this makes the restaurant accessible to all tastes. And to get that taste revving, grab a signature cocktail like the Valle Mistico, a surprising concoction of silver tequila, honey syrup and angostura bitters muddled with jalapenos, fresh lime juice and a splash of Campari. The most popular cocktail, the Pear Blossom, brings together pear vodka, cranberry, apple, fresh lemon juice and a pear chip. The wine list is daunting, with 124 bottles catering to numerous flavor profiles. 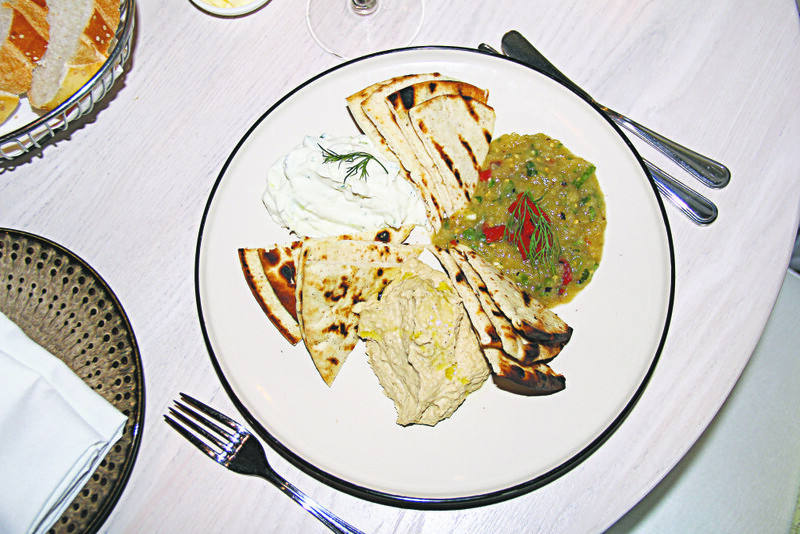 Start the meal with some cold appetizers, namely one or more of Taverna’s perfect spreads, including tzatziki, hummus and melitzanosalata, which features roasted eggplant, feta and garlic. The tzatziki is some of the best ever sampled, prepared rustic style with large chunks of cucumber providing a cool crunch. 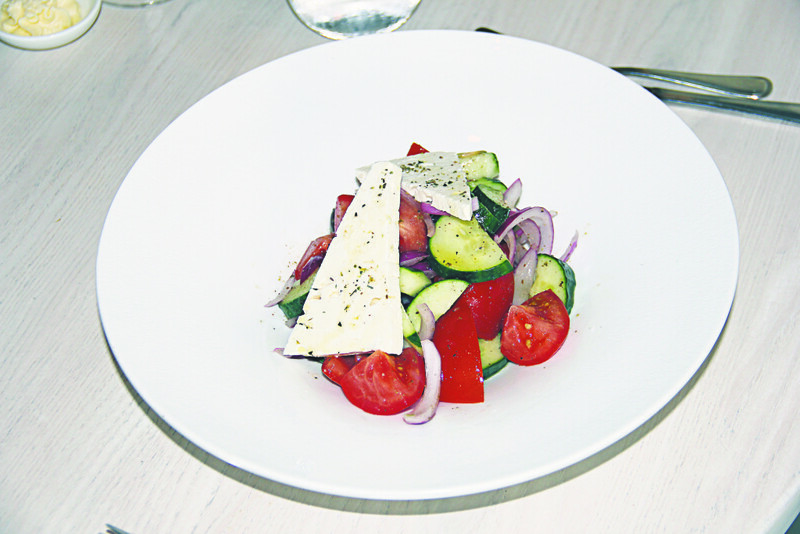 Mama’s Horiatiki salad continues the cold crispness, with tomato, cucumber, red onion, olives, wild oregano and feta triangles that add a beautifully nuanced, deep flavor to the salad. As for hot appetizers, Taverna 38’s biggest hits include the saganaki, spanakopita and kolokithokeftedes (zucchini fritters), but the must-try is the oxtapodi, which is tender grilled octopus with capers, red onion and a red wine vinaigrette. The octopus is perfect in every respect—tender with some char for wonderfully crunchy bits. The entrées are divided into From The Land, From the Sea and Yia Yia’s Kitchen, which consists of traditional favorites like mousaka and pastitsio. The “Land” menu includes steaks, burgers and lamb chops, but Taverna 38’s showstopper swims in the “Sea.” The whole grilled Branzino, flown in almost daily from Greece, is minimally treated for maximum flavor. Less is more with this dish, as the fish is grilled with some olive oil and little else. The white flesh is mild, yet compelling, while the skin’s contact with the grill transforms it into a crisp wonder with an intensity that lingers. For dessert, one can always count on the classic baklava and Taverna 38’s version is one of the best in recent memory. Go a step beyond and try the olive oil cake—a moist creation with homemade ice cream (all of Taverna 38’s ice creams are homemade) and a cranberry and strawberry compote. With a simple philosophy of great food and warm service elevated with exceptional examples of both, Taverna 38 is a superb discovery.